My complaint about the performing arts has always been that they require an enormous amount of practice time in proportion to the actual amount of performance time. Enter this article on increasing practice time productivity by 50%! The run down: If we sit down to practice with, say, 3 excerpts of music, we tend to practice the first except over and over for the first portion of time (say, 10 minutes). Then we go to the second, and spend the last portion of time on the third. The pattern is aaaaaaaa, bbbbbbb, ccccccc. This seems most efficient to us. The research says otherwise, though, indicating that alternating through the excerpts is more effective in the long run, which means our practice pattern ought to be abc, abc, abc, abc, or something even more random. We will still end up practicing each excerpt the same number of times, but we will have forced our brain to pay better attention to each repetition. Practice the sextuplets with a duple feeling instead of a triple feeling, in addition to practicing with dotted rhythms, which also helps when learning fast passages. Keep the thumb from sliding too far under the body of the instrument. 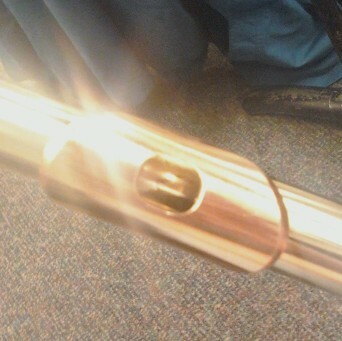 (For some reason, this tends to be a problem for me on the piccolo.) Maintaining good hand position keeps the fingers of the left hand more curved and more “above” the keys, and more able to move freely. Practice with a metronome. This helps tame the urge to practice it too fast before being able to play it at slower speeds. One thing any musician has to watch out for is “autopilot” mode. This is when we practice something without paying attention to what we are doing. It might seem impossible that you can be playing something without paying attention, but it still sometimes catch myself practicing something over and over, yet not really getting anywhere. It’s as though I expect that just because I am blowing air and wiggling fingers, I will somehow get better at the piece. The old adage “practice makes perfect” seems less accurate than the other old adage, “practice makes permanent.” I’ve never been one to do the penny game, where every time you play a passage correctly, you move a penny over, and if you mess up, you move all the pennies back and start over. Quite frankly, that sounds like low-grade torture to me. What I do advocate is that every time we play a passage, we maintain awareness, asking ourselves each time we practice a passage, “is this getting me closer to my goal?” If yes, then you can continue on your course. But if not, then you need to change course (which usually means practicing at a slower tempo). In practice, accuracy is more important than speed. Practicing fast will not allow you to play fast. Practicing accurately, on the other hand, will teach your fingers to play the correct fingerings, which will eventually lead to speed. Flute Talk is a great magazine, but it seems to me that their recent issues have been exceptionally excellent. The March 2009 issue contains an article by Alexis Del Palazzo titled “Teaching with Extended Flute Techniques” that discusses the benefits (such as tone development) of exploring extended techniques (such as harmonics, vocalization, and whistle tones) with younger players. The article points out that studying extended techniques as a beginning/intermediate student doesn’t have to be difficult; on the contrary, it can be quite fun, and in addition to developing tone, it can open up the mind to a wider variety of tone color possibilities. When I was in middle school, my English and Humanities teacher taught us to get started writing something by “breaking the power of the white,” which consisted of putting something — anything — down on paper, no matter how “bad” we thought it was, in order to get the ideas flowing. I think many of approach improvisation with a similar attitude: We’re not sure how to get started, and we’re afraid that our first attempts will be “bad.” With that in mind, I’d like to offer the following comments on attitudes and techniques for getting started with improvisation. Ask yourself if you want to be an improvisatory musician. Do you like improv? Do you want to try it? Then do it. Don’t worry about whether you’re “gifted” or not. Don’t worry about whether your initial attempts are “bad.” Who cares if they are? What’s important to remember, I think, is that we play music because we like it. That said, read on — I hope some of the tips below will help keep you from feeling you are “bad” at improvisation. The first thing you should do is start listening. Music, including improvisatory music, is an aural art form. We have ways of notating music, but until we get the style and feel of it into our heads, it can’t really come out of our heads. You can’t play anything until you can start to first hear it in your mind. Find radio stations (many are online now) and recordings of the improvisatory music you like and want to play. I myself tend to lean towards jazz. Whatever your choice, listening is where you start to get ideas from. The next thing you should do is memorize a melody you like. It’s OK if it’s technically easy! In fact, it should be, because the point is that you can memorize it easily. In short, don’t worry about what people (including yourself) think about your improv skills. If you want to do it, then jump in. Start in such a way that you can have fun right away, and you just might find yourself hooked on improv. Try to practice several different aspects of flute technique every day. Your daily practice regime should include long tones in the high, medium and low registers. The purpose of long tones is [to] work for purity and beauty of tone while playing long notes. Be self-critical, always striving for a better sound. A good long tone exercise book is De la Sonorite by Marcel Moyse (published by Leduc). Secondly, one should always practice scales and arpeggios — tongued and slurred. Start by learning all major and minor scales; practice playing them two octaves each. You should write out all these scales yourself. Next, you need to work on etudes. Choose etudes which are challenging, but not so difficult as to be unplayable. Solos are the last essential part of a good routine. As with etudes, pick solos which appeal to you and are challenging, but not beyond your level. It’s fairly common for flutists to become easily frustrated with double and triple tonguing. What’s important to remember is that it just takes time, and that’s really OK. It doesn’t have to be mastered overnight! Practice saying the syllables (“ta ka”) away from the flute, such as when you are showering or taking a walk. Isolate and practice the “back” syllable — the “ka.” Play scales or excerpts using only the “ka” syllable. This will feel slow and awkward; that’s OK.
Never play/say the syllables faster than you can while keeping them even. Practicing fast doesn’t make you able to play fast — it just makes you sloppy. Start slow and gradually speed up. Use a metronome. When the tonguing becomes uneven or sloppy, slow back down to a speed at which you can play correctly. It’s easy for the syllables to become clipped and detached, where the sound produced consists mostly of articulation sound rather than tone. This will only make it harder to coordinate your tongue with your fingers. Even if the passage you’re practicing is marked staccato, think of the syllables as being smooth and connected. Be sure your fingers are properly coordinated. If you have a couple of slow fingers that don’t move with the rest of your fingers, this will prevent notes from speaking properly, a factor that will become very apparent when trying to double/triple tongue. I would like to note that in the case of triple tonguing, I prefer the syllables “da ga da, ta ka da.” The “d” and “t” are similar, as are the “k” and “g,” but in my experience, the mind seems to struggle less with the above suggested syllables vs. the also commonly used “ta ka ta, ka ta ka,” which is actually double tonguing attached to triplet figures. It should be noted that double/triple tonguing is an important skill. In the earlier years, a flutist can get away with learning to single tongue faster, and might therefore get the idea that it’s not important to learn. But unlike other skills, such as the less-frequently used flutter tonguing, double/triple tonguing is a skill that will be useful and necessary to use much more often.